Maine Tales: Farmers Invade New York City. Robyn O'Brien on Real Food. Special Offer: FREE Five-Grain Cereal. Mailbox: Seed Exempt from Patenting, Nullifying Hemp Ban and Time to Fight for Organic. Slow Warm Up to Spring. Snow Gone, Inching Along. Our Precipitation last week was snow (above) but this week is rain. After a record cold March (9ºF below 30 year average), our April was cool - the coolest since 2007 – but not nearly as extreme as March. The unusually deep Winter snow pack has over the last month cleared out from most of the open ground. Exceptions are the woods and edges of fields. Both of our ponds still are covered in solid ice. Mark Fulford, our highly observant farmer friend in central Maine says soil is cold and leaf development on apple trees down his way this year is 10-11 days behind last year - which was also a cold Spring. One local farmer monitors ice-out on the nearby St. John River. He says a month after ice-out the ground is fit to plant potatoes. Ice-out was late this year and pegs potato planting May 18. 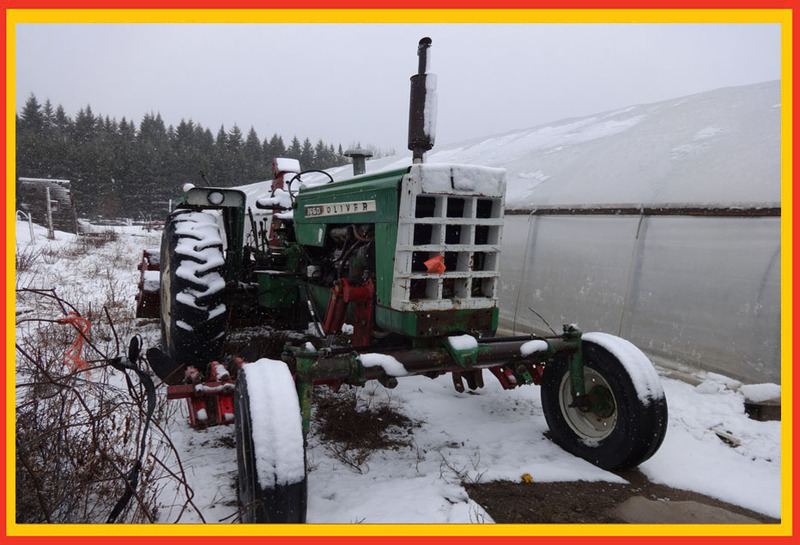 The old time farmers in these parts always said that when the last of the snow left the woods that is time to plant potatoes. Now that our Springs have become later, that woods snow typically leaves around mid-May. While that ground gets ready we're still shipping seed potatoes and now gearing up for planting. Maine Tales. Wood Prairie Farmers Invade New York City. New York. Circa 2014. New York City is just shy of 600 miles and 11 hours driving time from Aroostook County, Maine. 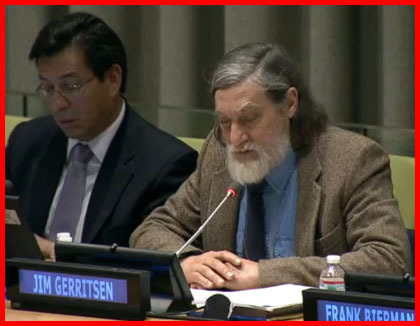 America’s Earth Day is April 22, as is International Mother Earth Day, celebrated at the United Nations. In 1820, the State of Maine gained independence from Massachusetts and the ‘District of Maine’ was a name heard no more. These disparate facts aligned themselves last week with a ‘farmer vacation’ (translation: pretty short). School kids in the State of Maine receive as Spring Break that one April week which contains ‘Patriot’s Day’ when citizens of just two States – Maine and Massachusetts – honor the American Revolution. And not coincidentally, one State holds its ‘Boston Marathon.’ Our country’s founders had given us our opening. So bright and early last week on Patriot’s Day, Jim, accompanied by daughters Sarah (15) and Amy (11) were driving south on I-95, NYC bound. It was to be the girl’s first time in the Big Apple. The occasion was the commemoration of International Mother Earth Day with the 4th Interactive Dialogue of the United Nations General Assembly on Harmony with Nature. Jim had been invited to speak as one of four invited panel guests. His speech was entitled Advantages and Challenges of Organic Farming: A Farming System Based on Harmony with Nature. We left with the ink on Jim’s speech still wet. Find here the United Nation’s video coverage of the 4th Interactive Dialogue and Jim’s speech (beginning at minute 32:00). Also, Jim’s interview on United Nation’s Radio may be found here. Find Jim’s reference to the World People’s Conference on Climate Change and the Rights of Mother Earth policy here: Universal Declaration of the Rights of Mother Earth. Linked here is the important book referenced in Jim’s concluding remarks: Nature’s Trust – Environmental Law for a New Ecological Age by Dr. Mary Christina Wood. Below are highlights from for Jim’s speech before the United Nations. The speech in it's entirety may be found here. Organic is Harmony with Nature. Challenges Are Political and Economic. "...Perhaps we may agree organic farming predicated on harmony with nature is our best choice going forward. Yet, organic farming does have challenges. These challenges are primarily political and economic in nature. They originate with powerful forces unwilling to give up wrested control and a risky focus on the short term gain. "...So how do we implement harmony with nature? I believe a study of the Public Trust Doctrine will be helpful. The Public Trust Doctrine – which goes back to Roman times - establishes as primary, the protection of Mother Earth. It holds that government simply does not possess the authority to sell or “privatize” the Commons. For example, the Public Trust Doctrine asserts government does not have the right to sell to a factory, via a permit process, the power to pollute the Commons, the water or air. Nor does it have the right to sell a government sanctioned monopoly – which is what a patent essentially is – to a corporation which takes an asset, such as seed, from the Commons. Lacking authority, these actions are illegitimate..."
Wood Prairie Farmer Jim Gerritsen. Speaking at the Untied Nations on International Mother Earth Day. Mother Robyn O'Brien. Don't miss her TEDx talk! Clear Thinker: Robyn O'Brien on Real Food. You will not want to miss this heartfelt personal story of how a mother with a past career on Wall Street found herself transformed into a good food advocate. Robyn McCord O’Brien tells her tale in this powerful TEDx video presentation (18:26). You will be glad you took the time to watch this excellent talk. It will inspire you as to what we as individuals can accomplish. I met Robyn in person for the first time last Winter and she is the real deal. You will see she is authentic, articulate and delivers convincing insight. Do NOT miss! 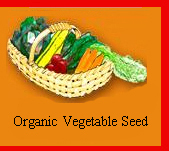 Click Here for Our Organic Wood Prairie Farm organic Vegetable Seed. 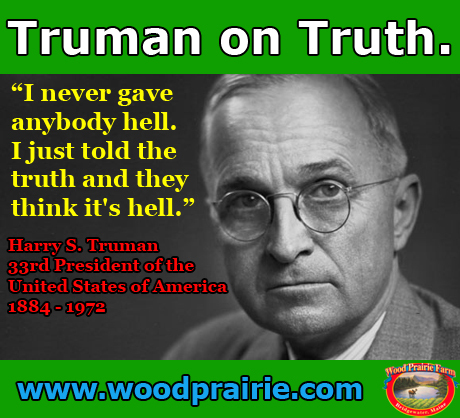 President Harry Truman. Speaking the truth. Melt 2 T of the butter in a large pot over high heat. Add one-third of the lamb or beef and brown on all sides, 4-5 minutes. Transfer lamb to a plate and repeat the process two more times, using 2 T of the butter each batch. Add onion and carrots to pot, reduce heat to medium, and cook until softened, scraping up any browned bits, 3-4 minutes. Return lamb or beef and its juices to pot along with flour and cook, stirring frequently, for 1 minute. Stir in stock or water, worcestershire, rosemary, thyme, nutmeg, and salt and pepper to taste. Bring to a boil and then reduce heat and simmer, covered, until meat is tender, about 40 minutes. Uncover pot and simmer, stirring often, until thickened, about 35 minutes more. Remove from heat, stir in peas and set aside. Meanwhile, put potatoes into a large pot and cover with salted water; bring to a boil. Reduce heat to medium-low and simmer until tender, 20-25 minutes. Drain and add 6 T of butter, half-and-half, salt and pepper to taste. Mash smooth with a potato masher. 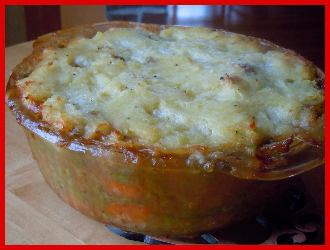 Preheat oven to 375 F. Transfer meat and vegetable mixture to a 2-quart casserole dish. Top evenly with mashed potatoes. Cut remaining 2 T butter into small cubes; scatter over potatoes. Bake until golden brown and bubbling, about 30 minutes. One of our family's favorites. Megan. Special Offer: FREE Organic Five Grain Cereal. Here in the East, we are still pulling out of Winter and the temperatures are still nippy in the mornings. These days a steaming hot bowl of fresh Organic Five-Grain Cereal is a delicious and inexpensive way to start off your day with a healthy meal that the entire family will enjoy. We mill this Organic Five-Grain Cereal weekly right here on Wood Prairie Farm so you can bet it’s as fresh as if you made it yourself. Our recipe is a special blend of 100% certified organic Oats, Wheat, Rye, Spelt and Corn. Add fresh or dried fruit and Organic Maple Syrup and you can have a simple and quick meal before you go off to school or working in the garden. Now, here's your chance to earn a FREE sack of Organic Five-Grain Cereal (Value $9.95) when the amount of goods in your next order is $45 or more. 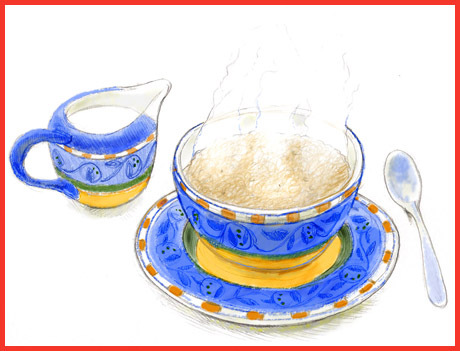 FREE Organic Five-Grain Cereal offer ends Midnight Monday, May 5, 2014, so better hurry! Please use Promo Code WPF1176. Your order must ship with FREE Organic Five-Grain Cereal and entire order must ship by 5/23/14. This offer may not be combined with other offers. Please call or click today! Wood Prarie Farm (800)829-9765. Click Here for Our Wood Prairie Farm Organic Granary Section. Five-Grain Cereal for Breakfast. Easy and inexpensive organic meal. Our Mailbox: Seed Exempt from Patenting, Nullifying Hemp Ban, Time to Fight for Organic. 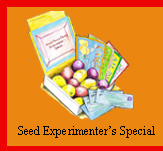 Did you see this article Plant Breeders Release First 'Open Source Seeds'? Yes, thanks for sharing. 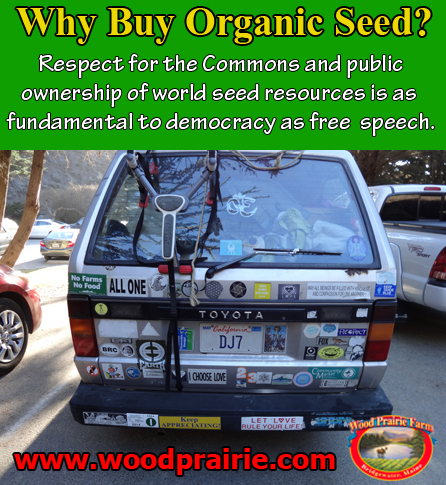 The dedicated folks involved are good allies in our organic seed community. The design is to begin to regain control of the seed supply in the Commons by introducing new Plant varieties which are purposefully protected and made exempt from patenting. The two organic seed companies mentioned in the article are members of Organic Seed Growers and Trade Association (OSGATA) of which I serve as President. Excellent news for Tennessee farmers I just hope it's organic! Tennessee effectively nullifies federal hemp ban. I recently enjoyed viewing the 'industrial hemp' documentary film Bringing it Home. The showing was hosted by the filmmaker, Linda Booker. The film is a great eye opener and society will be better off if farmers are allowed to grow hemp sooner than later. Bringing it Home Movie | A documentary film about industrial hemp. Time to Fight For Organic. I have always been very conflicted about the National Organic Program. I think people should rely on their own relationships with their suppliers whenever possible. That is obviously tough to do across 3,000 miles, but real farmers put the "grit" in integrity! The reality is our organic community should have honest organic certification because consumers need it. I have served on the MOFGA Certification Committee - and also the OCIA-NB Cert Comm - for over two decades. Let me try to put the current USDA power grab crisis into perspective. The organic community started up private systems of voluntary organic certification programs in the 1970s. This certification was invented to provide assurance to the organic consumer and level the playing field for farmers. The process resulted in a worked and reworked and reworked yet again refinement of what in fact became a functional definition of regionally-adapted acceptable organic production practices and allowable inputs. In order to meet those consumer assurance and level playing field goals, a definition is necessary plus a structural framework to protect and refine the definition - as well as protect the eaters and honest producers. By the mid to late 1980s the USDA was receiving tremendous pressure from various State Departments of Agriculture who were demanding that the USDA step up and facilitate interstate commerce and invent a single national organic certification system. The organic community was horrified by the prospect of USDA - which had a history of hatred for the concept of organic farming - inventing a definition of organic on its own and potentially resulting in the collapse of our industry. So the organic community reluctantly became involved in developing language in an effort to save itself and the interests of its members. Political allies of the organic community - Senator Patrick Leahy of Vermont and Rep. Peter DeFazio of OR became the chief sponsors of the Organic Foods Production Act (OFPA) which eventually was passed as part of the 1990 Farm Bill. The National Organic Standards Board (NOSB) was invented as the citizen oversight board - enabled by the OFPA. It serves as the interface for the organic community to interact with the USDA. This increasing trend of USDA reducing the autonomy and functioning of the NOSB, weaking the organic standards, and facilitating increased corporate control of the NOSB by outside conglomerates is unacceptable. Organic community articulation of this USDA power grab has now been joined by standup members of the NOSB and the original OFPA legislation sponsors Leahy and DeFazio. This is now the time for the authentic organic community to come together to protect ourselves. Particularly in the context of the consolidation of corporate control over our government and economy we must not let USDA transform the NOSB into a faint shadow of it's great potential. It's now or never. It's time to fight for organic.